The Ergonomic Black Swivel Chair is designed for comfort with a contoured back, swivel seat and an adjustable height handle for you or your clients. 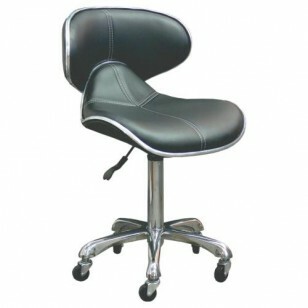 The seat also features an attractive exposed stitch pattern giving it a modern look sure to complement the overall look of your salon. Also, adding to the modern aesthetic are chrome accents on the outer rim and the 5 wheel base.